TALENTED ... Newcastle's Ayoze Perez. AYOZE Perez has revealed he turned down Real Madrid AND Barcelona to join Newcastle United. Perez scored the club’s winner in yesterday’s 2-1 win over Tottenham Hotspur. It was his first goal for the club since his summer move from Tenerife. 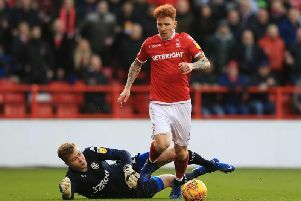 The 21-year-old had been handed his full Premier League debut after Papiss Demba Cisse was ruled out through injury on the morning of the game. Perez was signed after a prolific season in Spain’s second division. A number of top European teams had been tracking the forward, but Perez agreed to join Newcastle after the club activated his release clause. Asked about the reported interest from Real Madrid, Barcelona and Porto, Perez said: “Yes, there was interest from those teams. Perez says United “pushed hard” to sign him – and that convinced him it was the right move. Asked why he chose the club, Perez added: “They pushed very hard to get me. I feel they really valued me. “We had to consider the different options, and I finally decided to come to Newcastle. “I have always loved the Premier League, but the main reason to come here was how Newcastle valued myself.